Cloak and Dagger are making their way to television, and you can get hyped for it with a brand new poster. 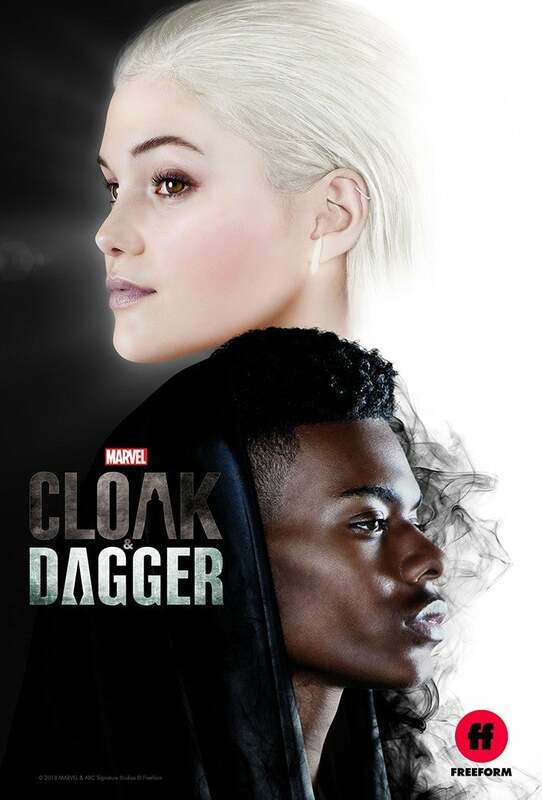 The poster features closeup shots of Cloak (Tyrone Johnson) and Dagger (Olivia Holt) next to that stylish logo and gives the faintest impression of their power set. You can see an aura of light around her face, giving a nod to her powers of living light and light daggers, while Cloak's aura gives a nod to the darkforce energy that he wields. You can check out the new poster in the image below. The two fan favorites debuted in Peter Parker: The Spectacular Spider-Man, which hit comic shops in 1982. The show looks to take a bit of a detour from their comic origins. In the comics, the two were injected with a deadly drug by a chemist named Simon Marshall, but unexpectedly they survived. Not only that, but they also ended up with powers, powers they used to take down Marshall and his drug ring, saving a myriad of people in the process. It was later revealed that the drug (called D-Lite) was actually created by D-Spayre, a frequent Doctor Strange villain. Ever since the two have been featured in a variety of ways, including sizable roles in Marvel's big events like Civil War and the more recent Secret Empire, where they helped keep New York lit with light after being stranded in a demonic universe. It seems it is finally their time to get some live-action shine, and we couldn't be more excited about it. You can find the official description of the series below. "Cloak & Dagger is a coming-of-age series based on the beloved Marvel characters. Tandy Bowen (Olivia Holt) and Tyrone Johnson (Aubrey Joseph) come from starkly different backgrounds, each growing up with a secret they never dared share with another soul." "Once a privileged little girl, Tandy Bowen watched as her family was destroyed by a disastrous storm that uprooted her life. Now in her late teens, an unexpected encounter with a boy named Tyrone sparks a life-changing event. Young Tyrone Johnson wanted nothing more than to prove he was fearless. But when everything he held close was taken away, life taught Tyrone to be afraid. Now older and more sheltered, Tyrone closes himself off. But when he meets a girl named Tandy his life changes forever." Marvel's Cloak & Dagger is set to debut on June 7 at 8 pm ET on Freeform.